Marco heads up Tempo’s Italian surety team and has over 20 years of Italian market expertise in credit, bonds, transportation, securities and other insurance classes across underwriting, claims and general management. 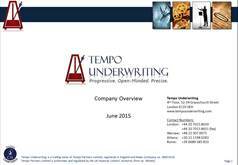 Marco joined Tempo in 2016 from M&S International Broker SRL, a wholesale broker specialising in Italian bond business which he founded in 2013. Marco’s early career was spent working with divisions of Generali, Zurich and Allianz and then Rhone Mediteranee SA. Thereafter, Marco held senior posts for several entrepreneurial intermediaries specialising mainly in developing and underwriting Italian bonds business including Italcauzioni SPA, Financial Risks Insurance and Nacora SRL.